I’m sorry for the delay in getting this post up, but in my defense, I’ve been working almost sixty hours a week for the last few weeks. Phew! Anyway, another busy fellow is our very own Daredevil who helps rescue not only the Avengers, but the rest of Manhattan in a Silver Age tale told in Avengers #82. This was Daredevil’s first proper guest appearance in the Avengers (though he did appear in Avengers #60, as a guest at the wedding of Janet van Dyne and Henry Pym) and took place long before it was common knowledge in the superhero community that Daredevil and blind attorney Matt Murdock were one and the same. 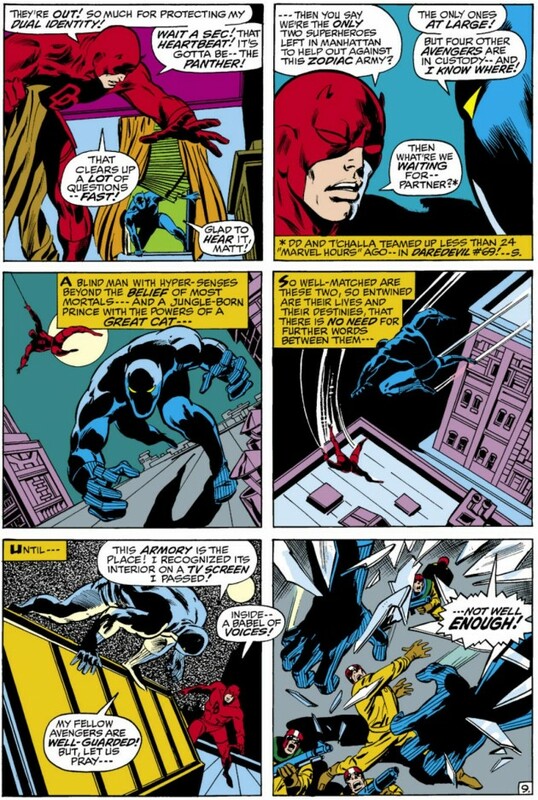 The only person in the know at this point was the Black Panther who shares the spotlight with Daredevil in this issue. Avengers #82, by Roy Thomas and John Buscema, opens with a night-time scene of Manhattan being invaded by the Zodaic Cartel. The details of the plot are narrated by the head of the large-scale hostage operation (the city is covered by a force field), Aries in a television broadcast on all channels. We are also shown an image of four of the Avengers – Iron Man, Thor, Captain Amarica and Quicksilver – being held captive under sedation. Among the television viewers are Scarlet Witch, Vision and Goliath who are stuck somewhere in Jersey where they are of no help to anyone on the other side of the force field. The situation looks grim indeed and Aries proclaims that if his gang isn’t paid one billion dollars, every inhabitant of Manhattan will be killed. Is it just me or does Daredevil sound like a five-year-old protecting his favorite toy? Anyway, Aries pulls a strange disappearing act and our two heroes get on their way. These events prompts Aries to take action and he decides to stage a public execution for the four captive Avengers. Somewhere between panels (in the span of about a page and a half), Daredevil has changed back into his civvies, topped off with in Matt’s own words – “a fright wig and left-over Mike Murdock shades” and joined the helpless masses gathered before the morbid spectacle that’s about to take place. He starts to rally the large audience against their captors, but is subdued, all according to plan, it turns out. When Matt is close enough to the stage he throws his cane/billy club into the backstage machinery necessary to hold Captain America, Iron Man, Thor and Quicksilver and they are able to break free (he apparently hears it humming and somehow figures out that it powers the glass cage contraptions). This sends Aries running since his entire plan was contingent on holding his four super-powered prisoners, and his army basically surrenders at the drop of a hat when they notice their leader jumping ship. Thor sets off in pursuit as Aries takes off in some kind of aircraft, but our villain is not willing to go out without taking his hostages with him and starts to lower the force field to bring it closer to street level where it somehow causes people to start suffocating. Thor then takes out the ship, causing the force field to be lifted. Everyone is free! This immediately takes us to an epilogue scenes where all of the Avengers (including the trio lost in Jersey) gather to compare notes. It turns out that they had all been investigating different cases that all lead back to the same source. This entire scene seems a bit forced, as if Roy Thomas just ran out of pages and had to wrap things up quickly. There was a lot of racial and urban unrest in the US during the 1960s and early 1970s. 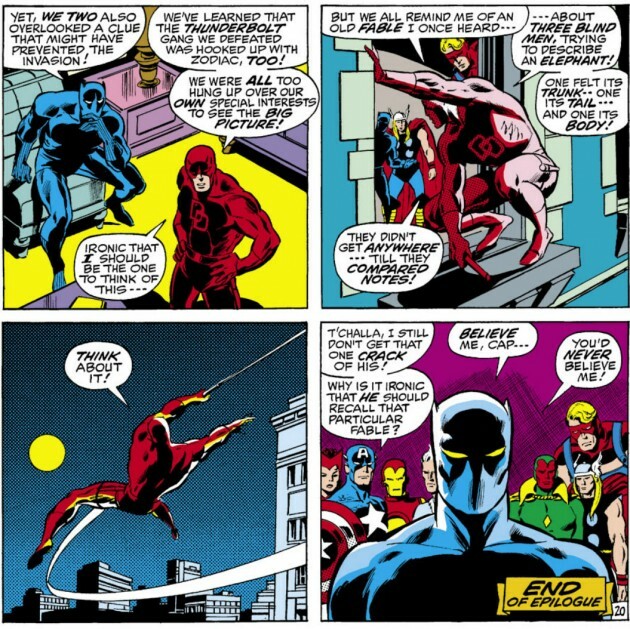 Daredevil and Black Panther were great symbols of civil and harmonious race relations. In my opinion it helped solidify in the mind of many people how people could coexist at a time when those ideas of fellowship were challenged by Vietnam, the death of MLK, and youth increasingly disillusioned by government. Many of those themes are in DD 69 (1970), also by Roy Thomas.